But sometime in the deep and distant future, it’ll happen: your childhood home will be turned into a national landmark. We know. We’re excited, too. In fact, we think it’s time to prepare now. Meet I Tour U, an iPhone app that lets you record your own commentary for an audio tour of anything you want, available online now. Imagine a typical museum audio tour. But replace the dry audio guide with your cunning wit. And instead of a museum, imagine, well, any place in the world. And then you’ll have this. So you’ll head to your old childhood estate, call up this app and begin narrating your tour. (It’ll automatically tag your location on the tour map.) As you move from room to room, you can add various stops so people can hear your recordings by specific location (“Now this is the den where I first played Twister with a young Beyoncé Knowles...”). 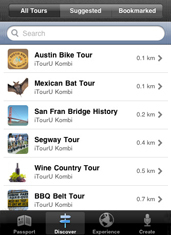 Eventually, you’ll be able to download tours from other people. (Here’s hoping Morgan Freeman catches wind of this.) And because this thing will work anywhere, you can lend your own rich baritone to any location you happen to be intimately familiar with—the Pyramids, Cowboys Stadium, Beyoncé’s childhood home. Actually, maybe keep that last one to yourself.